About two hours west of Philip Goldson Int’l Airport in Belize City, near the Guatemala border, is the town of San Ignacio. We spent several days here at the San Ignacio Resort Hotel, which served as a great jumping off point for several awesome excursions. 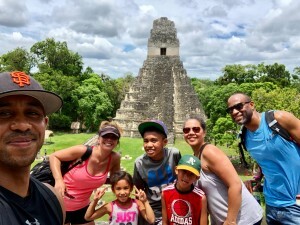 On our first full day we booked a tour to take us to Tikal National Park in Guatemala, an impressive site featuring ruins from an ancient Mayan civilization. This was a full-day excursion, and included lunch and transportation. Though it’s possible to drive yourself there, I recommend booking a tour with a driver because the border crossing into Guatemala is a bit tricky to navigate, and I really appreciated having a guide to assist us with this piece. I give this excursion five stars, though it should be noted that it is not recommended for those with mobility issues. We hiked about three miles around the park, not to mention the steep flights of stairs you need traverse to climb the various temples. The next day, we headed down to Caves Branch (about an hour from San Ignacio) for some cave tubing with CaveTubing.BZ. Such a fun day! After picking up our gear (innertubes, helmets with headlamps, and life jackets), we took a short hike through the jungle. After about 45 minutes of walking, we got to the starting point of our float. The remainder of the excursion was a leisurely float through the caves, looking at rock formations and the remains of a sacred Mayan altar. Thankfully we took this excursion before the news broke of the boys trapped in the Thai cave or it wouldn’t have been nearly as relaxing. After we exited the caves, we were able to swim in the river, which was super refreshing on a hot a humid day. Hode’s Place - Casual dining, known for their chicken wings! Smoothies also really good. Crave – More on the fine dining side of the spectrum… really great food and ambiance. The Ice Cream Shoppe – Right next door to Crave… we stopped there daily, lol.